Exercise Your Way to Mental Health! We are all aware of the physical benefits of regular exercise – including weight loss, muscle gain, increased strength and agility, and cardiovascular endurance. But did you know that exercise can improve your mental health, as well? Regular workouts, according to experts, can be just as beneficial for your mind as they are for your body. If you are feeling down, a quick workout can give you a burst of energy and improve your mood. When you work out, endorphins – hormones that make you feel happy and euphoric – are released in your brain, making you feel better. The positive effects of exercise on mood are even seen among people who suffer from clinical depression. Several studies have demonstrated that exercise results in increased neurogenesis and synaptic plasticity in key brain regions responsible for mood regulation. In this sense, exercise can function like an antidepressant. Physical exercise is an amazing, and virtually free, stress buster. Studies show that physical activity triggers the production of norepinephrine, a hormone and neurotransmitter that helps regulate your body’s stress response. Anxiety disorders are some of the most common psychiatric illnesses - affecting over 40 million people in the Unites States. That said, exercise can help alleviate general anxiety, as well as anxiety sensitivity, which precedes panic attacks in many people. Studies indicate that those who exercise regularly are less likely to develop anxiety disorders than those who lead sedentary lifestyles. So, the next time you feel a little anxious, hop on a treadmill and try going for a jog. Some cognitive decline is a relatively common part of aging. As you grow older, this decline may make it difficult for you to learn new things or recall information that was previously learned. These adverse cognitive effects generally result from a reduction in the amount of gray matter in the brain over time and degradation of the hippocampus – a key brain structure for learning and memory processing. However, experts suggest that one of the best ways to prevent or reduce cognitive decline is to exercise regularly. Moderate to intense physical activity done on a regular basis slows the degeneration of the hippocampus and helps you stay sharp, even with age. Research indicates that exercise can reduce an individual’s craving for cigarettes, alcohol, or other drugs and decrease the negative effects of withdrawal symptoms. This is because both addictive substances and exercise generate dopamine, a “reward” neurotransmitter produced in response to pleasurable activities. Specifically, short bursts of intense exercise have been found to be particularly effective at promoting dopamine release compared to other forms of exercise. Research shows that those who work out regularly have a positive self-image and an elevated perception of self-worth and attractiveness. If you exercise regularly and stay in good shape, you feel more attractive on a subconscious level, which increases self-confidence. Studies also suggest that exercise can boost creative thinking. So, the next time you are struggling with writer’s block, just hit the gym or go for a run. As you can see, engaging in regular exercise is one of the easiest and most effective ways to both stay in excellent physical shape and keep your mind alert and sharp, so stay active to stay healthy and happy. Jack Fleming is a personal trainer with over 20 years of experience in the fitness industry and writes regularly for several health/exercise websites, including treadmilltalk.com. Cırrık, S., & Hacioglu, G. (2016). Neurophysiological Effects of Exercise. In H. Sozen (Ed. ), Fitness Medicine: Intech. De La Garza II, R., Yoon, J. H., Thompson-Lake, D. G. Y., Haile, C. N., Eisenhofer, J. D., Newton, T. F., & Mahoney III, J. J. (2016). Treadmill Exercise Improves Fitness and Reduces Craving and Use of Cocaine in Individuals with Concurrent Cocaine and Tobacco-Use Disorder. Psychiatry Research, 245, 133-140. Otto, M. W., Church, T. S., Craft, L. L., Greer, T. L., Smits, J. A. J., & Trivedi, M. H. (2007). Exercise for Mood and Anxiety Disorders. The Primary Care Companion to the Journal of Clinical Psychiatry, 9, 287-294. Silverberg, A. B., Shah, S. D., Haymond, M. W., & Cryer, P. E. (1978). Norepinephrine: Hormone and Neurotransmitter in Man. American Journal of Physiology - Endocrinology and Metabolism, 234, E252-E256. Think of how you feel during a long lecture or meeting… Do you feel like your brain is about to burst? As much as you would like to excuse yourself on account of having a “full brain” and go grab lunch, that might not be possible… Unfortunately, the picture above is totally wrong! Instead, as a recent study in Nature Neuroscience found, your brain does not get “full” to the point where it stops working. It just forgets irrelevant old memories to make room for new ones that you need to remember. The study, conducted by Maria Wimber and colleagues in the UK, used a brain imaging technique known as functional magnetic resonance imaging (fMRI) to see the process of forgetting as it unfolded inside the human brain. Wimber and colleagues designed their experiment based on prior research, which suggested that learning and forgetting work together. Specifically, learning a new piece of information causes your memories of other pieces of information (often those that are most similar to the new information) to weaken. Although this might seem like a problem, neuroscientists argue that it actually helps you to recall relevant information as easily as possible. While participants completed the task, Wimber and colleagues monitored their brain activity with fMRI. As the target memory was retrieved again and again, the researchers found that the brain activity associated with it increased. However, brain activity associated with the competing memory decreased, or was inhibited. Additionally, Wimber and colleagues noted that these changes were largest in areas near the front of the brain, particularly in the prefrontal cortex. Since prior research showed that the prefrontal cortex is involved in retrieval, the fact that there was activity in this area suggested that forgetting the competing memory was related to more efficient retrieval of the target. You spend three weeks reading a book. During that time, you commit all of the character’s names to memory, and remember details of the plot. When you finish the book, you move on to another one, obviously with different characters and a different plot. Since it would be difficult to remember the new book with details from the old one still in your head, the old information is gradually forgotten and replaced. Just think what it would be like if you remembered every detail of every book you ever read… It would be completely overwhelming! As a result, one could say that your brain depends on forgetting to remember, but fortunately, it does not need to remember to forget. Kuhl, B. A., Dudukovic, N. M., Kahn, I., & Wagner, A. D. (2007). Decreased demands on cognitive control reveal the neural processing benefits of forgetting. Nature Neuroscience, 10(7), 908-914. Merriam-Webster. (Ed.) (2015) Merriam-Webster (Online ed.). Springfield, MA: Merriam-Webster, Inc.
Preston, A. R., & Eichenbaum, H. (2013). Interplay of Hippocampus and Prefrontal Cortex in Memory. Current Biology, 23(17), R764-R773. Wimber, M., Alink, A., Charest, I., Kriegeskorte, N., & Anderson, M. C. (2015). Retrieval induces adaptive forgetting of competing memories via cortical pattern suppression. Nature Neuroscience, 18(4), 582-589. Wimber, M., Bauml, K.-H., Bergstrom, Z., Markopoulos, G., Heinze, H.-J., & Richardson-Klavehn, A. (2008). Neural Markers of Inhibition in Human Memory Retrieval. The Journal of Neuroscience, 28(50), 13419-13427. For us at The Think Tank, neuroplasticity – the concept that pathways in the brain grow stronger with practice – is central to our educational mission. When we hit the streets and sidewalks of Chicago with our “Wacky Beanbag Toss” demonstration (Check out a neat video here! ), we are showing participants that their brains can rapidly learn to adapt to a new situation, like seeing the world through funny prism goggles. Every time we enter a classroom, our “Pump Up Your Brain” lesson helps high school students realize that they are in control of their brains, and ultimately, their own learning processes. Although these initiatives have produced incredible results, we always like to highlight programs that are promoting the power of neuroplasticity in other fascinating ways. The Harmony Project is a nationally-recognized arts education program in Los Angeles, CA that is dedicated to using instrumental music as a vehicle for child development and social change in underserved communities. With their widespread impact – reaching over 2,000 students in the LA area in 2016 – and evidence-based model, The Harmony Project caught the attention of Nina Kraus and her colleagues at Northwestern University’s Auditory Neuroscience Lab. In their 2014 study, Kraus and colleagues worked with Harmony Project staff and 26 of their elementary school students over two years to explore how music education affected neuroplasticity and language development among children from disadvantaged backgrounds. Their work built on prior research demonstrating these children are often subjected to an excessive amount of auditory noise, while they are simultaneously exposed to fewer words and less complex language during the early stages of development compared to other children. Specifically, these conditions contribute to a vocabulary gap of around 30 million words between children with lower socioeconomic status and their more advantaged peers by the age of four. As the researchers followed the Harmony Project students through classes on music appreciation and instrument lessons, they found that students who were highly engaged (i.e., high participation and attendance rates) in the Project reaped considerable brain-based benefits for language development, compared to their peers who were less engaged in the Project. When Kraus and colleagues measured students’ brain activity while they listened to a recorded speech syllable, they found that – thanks to neuroplasticity - the students who were more engaged during The Harmony Project had stronger speech-processing pathways in their brains. As a result of their musical training, engaged students could more easily identify subtle acoustic distinctions that are common to both music and spoken language. Furthermore, the researchers found that the students who were more active participants in their Harmony Project classes were more likely to become better readers over the two-year study period compared to their less-engaged peers. Overall, Kraus and colleagues demonstrated the power of music education for language development among disadvantaged students. Although the results are impressive, the importance of classroom engagement for promoting these benefits cannot be overemphasized. That said, as long as students stay engaged, the power of music to promote academic achievement through neuroplasticity is tremendous. Hart, B., & Risley, T. R. (1995). Meaningful differences in the everyday experience of young American children. Baltimore, MD: Paul H Brookes Publishing. Kraus, N., Hornickel, J., Strait, D. L., Slater, J., & Thompson, E. (2014). Engagement in community music classes sparks neuroplasticity and language development in children from disadvantaged backgrounds. Frontiers in Psychology, 5, 1-9. Turner, C. (2014). This Is Your Brain. This Is Your Brain on Music. All Things Considered. Washington, D.C.: NPR. UChicago Creative. (2015). The Illuminoggin Unveiled at Brain Awareness Day. Chicago, IL: The University of Chicago. Imagine holding this ball of yarn… Without unraveling it, try to follow each thread... Trace its path, and see how many times a thread reappears in the same area. Are you sure it’s the same one?! As if that task wasn’t hard enough, now imagine wedging a pair of scissors into the yarn ball, and cutting a few threads at random. After removing the scissors, can you tell which threads you cut? For University of Pittsburgh psychologist Walter Schneider and his neurosurgeon collaborators, David Okonkwo and Juan Fernandez-Miranda, their newly developed imaging technique - high-definition fiber tracking (HDFT) - allows them see where those scissors cut inside the largest, most complicated yarn ball imaginable: the human brain! In 2010, about 2.5 million visits to the emergency room, hospitalizations, or deaths were associated with traumatic brain injuries (TBIs) in the United States. Although TBIs are disturbingly common among our nation’s veterans and professional athletes, they occur in the general population more often than you might think. According to the Centers for Disease Control and Prevention (CDC), falls accounted for 40% of all TBIs in the U.S. between 2006 and 2010, and automobile accidents were the third-largest cause of TBIs, at just over 14%. For people who suffer with TBIs, everyday life is often challenging. Even basic tasks like reading and walking can become impossible. For the patients’ friends and family, drastic personality changes caused by damage to the brain’s emotion and reasoning areas may turn their best friend, father, or husband into an unpredictable – even violent - stranger. Perhaps the saddest part of the story for TBI patients and their families is just how difficult it is to identify the neurological causes of their injuries. That is, when they were in that car accident, or fell off that ladder, where did the scissors cut? What “threads” inside their brain were severed, and how can that explain their poor memory, or emotional outbursts? Until Schneider and colleagues developed HDFT, it was extremely difficult to answer those questions. Although doctors used technology like CT scanning and diffusion tensor imaging (DTI) to look at the brains of TBI patients, the damage to the brain was “invisible” with that technology, and the patients went home with a “clean” bill of health. Now with HDFT, neurologists can see all 40 of the major tracts in a patients’ brain. This allows them to diagnose exactly which connections were damaged in a TBI to develop appropriate treatment. For TBI patients and their families, HDFT visualization provides them with the answers they desperately seek. As explained in a Discover magazine article about HDFT, neurologists can even use an iPad® app to show a patient their own brain scans. By looking at the scans, patients and their families can see precisely what is wrong to better understand their mysterious TBIs. HDFT also guides therapeutic approaches to make daily life better for TBI patients. After a physician understands which pathways in their patients’ brain are impaired, they can help their patient function better using alternative pathways. For one Army veteran whose TBI made reading difficult, a member of Schneider’s team suggested that he read while listening to music, and tapping out the words in time to the beat. Although the veteran admits that it looks like he’s “cutting a rap record” when he’s reading, the technique has proven effective, thanks to an accurate HDFT scan that indicated to the veteran’s doctors exactly which circuits were still intact and fully functional. While HDFT is new, and some researchers question how accurately it can quantify impaired brain circuitry, the technology’s impact on the lives of TBI patients and their families is undeniable. As scientists and physicians call for improvements in existing neuroimaging technologies like DTI, High-Definition Fiber Tracking will become a critical tool for solving the brain’s most “unsolvable” mysteries. Chmura, J., Presson, N., Benso, S., Puccio, A. M., Fissel, K., Hachey, R., . . . Schneider, W. (2015). A High-Definition Fiber Tracking Report for Patients With Traumatic Brain Injury and Their Doctors. Military Medicine, 180(3S), 122-134. Farquharson, S., Tournier, J. D., Calamante, F., Fabinyi, G., Schneider-Kolsky, M., Jackson, G. D., & Connelly, A. (2013). White matter fiber tractography: why we need to move beyond DTI. Journal of Neurosurgery, 118(6), 1367-1377. Fernandez-Miranda, J. C., Pathak, S., Engh, J., Jarbo, K., Verstynen, T., Yeh, F.-C., . . . Friedlander, R. (2012). High-Definition Fiber Tractography of the Human Brain: Neuroanatomical Validation and Neurosurgical Applications. Neurosurgery, 71(2), 430-453. Thomas, C., Ye, F. Q., Irfanoglu, M. O., Modi, P., Saleem, K. S., & Leopold, D. A. (2014). Anatomical accuracy of brain connections derived from diffusion MRI tractography is inherently limited. Proceedings of the National Academy of Sciences, 111(46), 16574-16579. As we speed through the Fall, we wanted to look back on some of the milestones THE THINK TANK rolled past during the 2015-16 academic year. Here are some highlights of our trips to schools and festivals – events that got a whole lot brainier once THE TANK arrived! THE THINK TANK Brainifies Washington D.C.
What’s higher than a highlight? Whatever it is, that’s the word to describe our 1,400 mile road trip to the USA Science and Engineering Expo in Washington D.C.
TTT was honored to represent the National Science Foundation at the nation’s largest STEM expo – attended by about 365,000 sci-curious students and families. Five of TTT’s BRAINIACS made the trek to and from D.C.
Our team joined about 3,000 presenters from all over the US. NASA sent this guy. Kids were amazed that they could control a computer with their brainwaves, using our portable EEG headsets. Our ILLUMINOGGIN is pretty big and flashy (literally!) so it attracted a lot of attention. But the competition for people’s attention was stiff -- just a few booths away from us was a fighter jet…so, at times we felt a little outgunned. Still, our booth was packed. Amid all the high-tech demos, kids lined up around the corner to do even our lowest-tech demos – like this young Tanker who couldn’t get enough of our beanbag-toss neuroplasticity demo. The NSF estimates that our team engaged 10,000 people in 3 days. Earle delivers cutting-edge STEM education to South Side elementary schoolers. 99% of Earle’s kids are Black or Hispanic – which means that Earle STEM is changing the face of science, and TTT is there to help. Sital shows this scientist-in-training how to control a robot with her mind! 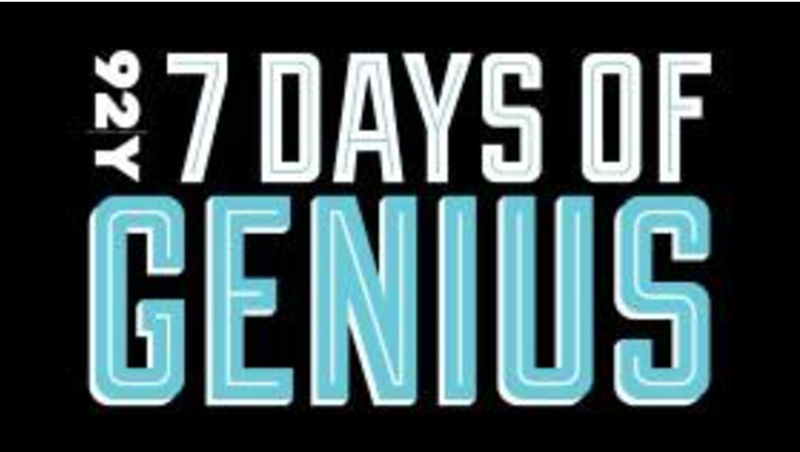 We teamed up with New York’s 92nd Street Y for the second consecutive year to livestream Genius: Mind, Brian, and Molecules, a talk that was part of 92Y’s 7 Days of Genius Festival, for the UChicago community. Moderated by Nobel Laureate and neuroscientist Eric Kandel, M.D., the talk literally put the history of brain research on center stage. Toward the end of our season, we brought our knowledge back home and set up in our home base, right on the UChicago quad! Lured by the smell of pizza and the sight of our neon green Tank, our college students found that, despite their already stellar UChicago education, there was still a lot more to learn about the brain. We couldn’t have asked for a more perfect Spring day to recruit a new bunch of UChicago BRAINIACS. Some of our most enthusiastic participants weren’t quite ready for college. We brainified the first-ever Lorca Elementary Science Night at Lorca Elementary School! Named for the great Spanish poet Federico García Lorca, this bilingual school serves a student body that’s over 90% Hispanic, and 95% of the students are from low-income families. We were honored to partner with them, and can’t wait to visit again! We finished out the year with a visit to the Homewood Science Center Fair, where our team had a great time running demos and soaking up the sun! Balloon vs. Illuminoggin – the balloon may be pinker, but the ‘Noggin was definitely bigger! As always, a HUGE thank you to every school, organization, and individual that partnered with us this past year. With your support, we can accelerate diversity in science! Are you always losing your phone or your keys? Do you have trouble remembering directions? Maybe climbing that tree in your backyard would help! According to a study published in Perceptual and Motor Skills by University of North Florida psychologists, Drs. Ross and Tracy Alloway, engaging in proprioceptively dynamic activities for just a few hours can dramatically improve your brain’s cognitive performance. Alloway and Alloway broke new ground with their experiment, focusing on the relationship between proprioceptively dynamic activities and working memory for the first time. Participants included adults across a wide age range, divided into one experimental group and two control groups. The experimental group had their baseline working memory tested, and then completed two sessions of proprioceptively dynamic activities with breaks for working memory tests after each session. These activities included climbing trees, balancing on a beam, moving while paying attention to posture, running barefoot, navigating obstacles, and lifting and carrying objects. In contrast, the other participants did not get to have nearly as much fun trying to improve their working memory… The first control group sat in a lecture hall and listened to new information for two hours, and the second practiced Kripalu yoga – a type of yoga focused on posture and bodily awareness. The researchers found that the participants who balanced on beams, ran, climbed, and did other proprioceptively dynamic activities significantly improved their working memory performance. Meanwhile, the control participants did not show significant working memory benefits from their tasks. Alloway and Alloway explained these results in terms of how quickly the brain needs to adapt to an ever-shifting environment during a proprioceptively dynamic activity like balancing on a beam. While the participants who practiced Kripalu yoga were learning to be aware of their bodies, the researchers suggested that they were not moving quickly enough to use – and strengthen - their working memory. Alloway and Alloway designed their experiment based on prior research examining the relationship between exercise and the brain (Take a look at this great cartoon! ), including a previous study that showed how a neuromuscular and proprioceptive training program could reduce injury in soccer players, and another that indicated the physical and cognitive benefits of proprioceptively demanding activities for elderly people. In the future, Alloway and Alloway would like to determine which forms of proprioceptively dynamic activities are most beneficial for improving working memory. Until they know which ones are best, though, just have fun! Climb a tree at lunch, and then walk along a curb on your way home… Your brain will thank you! Proprioceptively Demanding Training: A Pilot Study. Perceptual and Motor Skills, 120(3), 766-775. Bergland, C. (2015). Want to Improve Your Cognitive Abilities? Go Climb a Tree! Heffner, C. L. (Ed.) (2015) AllPsych. PsychCentral. Mandelbaum, B. R., Silvers, H. J., Watanabe, D. S., Knarr, J. F., Thomas, S. D., Griffin, L.
Y., . . . Garrett Jr., W. (2005). Effectiveness of a neuromuscular and proprioceptive training program in preventing anterior cruciate ligament injuries in female athletes. The American Journal of Sports Medicine, 33(7), 1003-1010. ScienceDaily. (2015). Climbing a tree can improve cognitive skills, researchers say. Exercise-Based Intervention on Physical and Cognitive Performance for Older Adults: A Pilot Study. Journal of Geriatric Physical Therapy, 33(4), 157-164. That’s a cool picture, right? It’s a neuroscientist holding a real human brain! Now, pick up a piece of paper, and crumple it into a ball. Do you see any similarities…? You should! According to a study published in Science last July by Brazilian scientists Bruno Mota and Suzana Herculano-Houzel, the mammalian brain grows and folds just like a sheet of paper, following the same mathematical pattern. Now, the researchers’ results may end centuries of debate about how the mammalian brain became so wrinkled. To retrace the steps leading to Mota and Herculano-Houzel’s findings, the surface of the human brain – along with the brains of some other large mammals - is covered by an intricate pattern of gyri (ridges) and sulci (valleys), making it quite lumpy compared to most animals’ brains. As with many other biological traits, the reason for our folded brain lies in evolution. With folds, each part of the brain is closer together, so sending information-carrying signals from one region to another requires less distance and time, making the process more efficient. Although neuroscientists knew that gyri and sulci develop in the human brain during the third trimester of pregnancy, the precise forces behind their formation were controversial among brain researchers, according to an article in Scientific American describing Mota and Herculano-Houzel’s study. The first hypothesis was based on brain size. Essentially, some researchers thought that the larger the brain, the more folds it would have. However, this did not explain mammalian brains like the manatees’, which is much smoother than the similarly-sized brain of the baboon. Other mammals, like the dolphin, also had brains that seemed “too wrinkled” for their size. The second hypothesis was based on the number of neurons, claiming that more folded brains contained more neurons. However, neuroscientists found exceptions to this claim, too. For example, the wrinkled cortex (outer layer) of the human brain has three times as many neurons as elephant cortex, but human brains are only half the size with less folding. Until Mota and Herculano-Houzel, this variability led scientists to believe that the processes underlying brain folding were unique to every animal. However, Mota and Herculano-Houzel’s “eureka moment” came when they realized that the mathematics responsible for crumpled paper and a crumpled brain are exactly the same! Both objects are exposed to environmental forces that cause them to take the most stable form possible. For paper and brains, these forces are controlled by two factors: Thickness and surface area. A thicker piece of paper – and a thicker brain – each have fewer folds with less material hidden inside each wrinkle. By contrast, pieces of paper - and brains - with greater surface areas have more folds due to their larger size. To understand how brains become folded, it is important to remember that they are subject to forces from all directions during development. First, gravity pushes down on the growing brain, just as fluid within the brain is pushing outwards. Each new cell in the brain also applies its own outward force as the entire organ expands. These forces combine with the properties of thickness and surface area to create the amazing network of folds in the human brain, and those of other large mammals like the dolphin. Moving forward, Mota and Herculano-Houzel suggest that their “crumpled paper” model will impact the work of many other neuroscientists. They predict that their results will be especially important for researchers who study the cells that produce neurons and those who are working to understand structural disorders of the brain where the folds do not form correctly. Mota, B., & Herculano-Houzel, S. (2015). Cortical folding scales universally with surface area and thickness, not number of neurons. Science, 349(6243), 74-77. Stare at the pink dot on The Think Tank while you count to 10. Then look at the pink dot on the right and count to 3 while letting your eyes blur slightly. When The Think Tank takes science to the streets, we show people that they have the power to change their own brains and minds. A favorite children’s book shows just how fast we can change them. Renowned author Eric Carle introduced many children to the curious case of color afterimages through Hello, Red Fox – a strange title if you do not consider the psychological concept at the center of the story. So color afterimages are fascinating, and they have been popularized by a children’s book author, but why do they happen? To answer that question, we must journey deep inside the human eye to a region called the retina. That is where light from the world enters and information about it – including its color - is sent to the brain. When light reaches the retina, it interacts with special light-detecting cells called photoreceptors. Most importantly for color afterimages, the retina is lined with rows of cones, which are special photoreceptors that detect color. In more scientific terms, color afterimages can be explained by opponent process theory. As described by University of Calgary psychologist Donald Kline, the theory outlines how the cones in the retina are “…linked together to form three opposing color pairs: blue/yellow, red/green, and black/white. Activation of one member of the pair inhibits the other.” In terms of a color afterimage, this means that when the initially activated member of a cone pair (e.g., the red cone) becomes “fatigued”, inhibition of the partner cone (e.g., the green cone) is reduced, making it relatively more active and generating a green afterimage. Returning one last time to the Tank afterimage activity, the pink and green afterimage you saw demonstrated how just 10 seconds of concentration can literally change how you see color. Now, if 10 seconds can have such an impressive effect on your brain and mind, think about all the benefits to be gained from a longer period of concentration, like when you practice violin every day, or do your homework. That’s neuroplasticity at work – the biological malleability of the brain and mind through experience and practice. As color afterimages show us, this principle is powerful, and seeing different colors is just the beginning. Hurvich, L. M., & Jameson, D. (1957). An Opponent-Process Theory of Color Vision. Psychological Review, 64, 384-404. So, You’re Reaping the Bounty of Your Growth Mindset… Now it’s Time to Plant Some Grit! What do a West Point cadet, Ivy League undergraduate, and Scripps National Spelling Bee finalist have in common? They’ve all got grit! Last week, we introduced you to Growth Mindset, the concept that your skills and abilities can improve through learning, perseverance, and good mentoring. Although we did not mention it at the time, Growth Mindset is closely related to another non-cognitive skill, and the topic of today’s post, known as grit. Introduced in a 2007 paper by University of Pennsylvania psychologist Angela Duckworth, people with grit exhibit “perseverance and passion for long-term goals.” Although these individuals often have Growth Mindsets, too, their focus on the long-term allows them to persist through short-term challenges. For example Duckworth and colleagues' paper demonstrated the power of grit with a group of West Point Military Academy cadets entering their first summer of training – a physically, mentally, and emotionally exhausting period called “Beast Barracks.” Using their grit scale, the researchers wanted to see how well grit could predict which cadets would remain at West Point after the summer. Duckworth and colleagues found that grit was the best predictor of which cadets stayed, even beyond West Point’s own system for predicting cadet retention! Duckworth and colleagues also explored the power of grit with University of Pennsylvania undergraduates, and Scripps National Spelling Bee contestants. Among the University students, grit was a significant predictor of GPA, although it was associated with lower SAT scores, suggesting that the “less smart” students could have relied on their grittiness to “make up the difference” in the classroom. At the National Spelling Bee, grittiness predicted which spellers would advance to further rounds, and how many National Bees they had previously attended. Since its debut, grit’s popularity has soared - with Duckworth’s TED Talk viewed over 8 million times on the TED website! In 2014, psychologists in the Duckworth Lab even discovered that grit could predict all sorts of life outcomes, from how likely a sales employee was to keep their job to how likely a man was to stay married. That said, nowhere has grit been more important – and more controversial - than in the classroom. Grittiness predicts both a students’ likelihood to graduate from high school, and a teachers’ likelihood of staying and teaching in a “tough neighborhood.” As a result, teachers are racing to learn more about grit, and figure out how they can apply it in their classrooms. Fortunately for our nation’s teachers, Duckworth and colleagues emphasize that grit can be taught – just like Growth Mindset! In fact, an in-class intervention is underway right now to build grittiness among low-achieving students, with results coming soon! Despite the growing support for grit among educators and researchers, Duckworth and her colleagues urge caution when it comes to using the Grit Scale like a standardized test to evaluate teachers and schools. As Duckworth and David Scott Yeager emphasize in their 2015 paper, the current tools for measuring grit – student psychologists and educators should carefully “seek out the ‘most valid measure for their intended purpose.’” In terms of using grit as an evaluation tool, Duckworth and Yeager say that we need to know more about how to use grit data to improve classroom instruction before rushing to judge teachers and schools on student grittiness. Kohn also commented that it is equally important to learn when it is okay to walk away from a task, noting “…It can take guts to cut your losses. That’s as important a message to teach our children as the usefulness of perseverance.” Finally, he was concerned that Duckworth’s research focuses on naturally persistent people (like West Point cadets and Spelling Bee finalists), seeming to ignore everyone else, but Duckworth and colleagues acknowledged this shortcoming in their 2007 paper, which is likely why they began the in-class intervention described above. However, Kohn’s last two points still seem important to think about. First, he argued that grit supporters value depth and specialization over breadth and exploration, a timely statement given the ongoing discussion in education about college and career-readiness. Lastly, Kohn labeled grit as “politically conservative”, claiming “The more we focus on whether people have or lack persistence (or self-discipline more generally), the less likely we’ll be to question larger policies and institutions” – and in an age of education reform, this is important to consider. Grit is impressive, but complicated. While it is a powerful predictor of tomorrow’s success, factors like student ambitions and underlying flaws in the educational system should not be ignored, and policymakers and administrators should recognize the limitations of our current tools. As long as those issues are recognized, grit itself remains a critical and teachable skill for today’s children. Duckworth, A. L. (2013). The key to success? Grit. TED Talks Education. New York, NY: TED Conferences, LLC. Eskreis-Winkler, L., Shulman, E. P., Beal, S. A., & Duckworth, A. L. (2014). The grit effect: predicting retention in the military, the workplace, school and marriage. Frontiers in Psychology, 5, 1-12. Perkins-Gough, D. (2013). The Significance of Grit: A Conversation with Angela Lee Duckworth. Educational Leadership, 71(1), 14-20. Robertson-Kraft, C., & Duckworth, A. L. (2014). True Grit: Trait-level Perseverance and Passion for Long-term Goals Predicts Effectiveness and Retention among Novice Teachers. Teachers College Record, 116(3), 1-27. Think about how many times you have used the word “can’t”…Today? This week? This month? Do you at least think it to yourself a few times, whether you’re at your desk, or on the treadmill? Is it a nightly complaint when it’s time for math homework? Now, try adding “yet” to the end of every “can’t” statement, or “can’t” thought. See how quickly the mood changes? You are already thinking about your actions in a more positive way. With a lot of hard work, some support, and a little bit of time, you will finish that report. You will run that 5K. And your kids will figure out how to do that math problem. The power of “yet” is the foundation of Growth Mindset, a motivational idea pioneered by Stanford psychologist Carol Dweck that sees a person’s intelligence, athletic skill, musicianship, etc. as capable of development through continued learning, perseverance, and good mentoring. With this new perspective, people begin to value the learning process, seek out challenges, and take risks – all positive outcomes that others with traditional Fixed Mindsets avoid. For us at The Think Tank, growth mindset is a guiding philosophy. We have visited dozens of Chicago-area schools over the past few years to present “Pump Up Your Brain!”, a hands-on lesson that is filled with demonstrations and experiments like this one, and is designed to show students the neuroscience behind growth mindset. If they adopt a growth mindset and are willing to practice, their brains will grow stronger and support learning. It’s just basic biology! What was the most interesting or exciting thing in today’s class? Student: Learning that my brain is like Play-doh. I thought it was like a brick. Another Student: The connections that this class made to real-world things. Gave me a lot of insight on why I need to work harder to do better at math. How did this class affect the way you think about science and scientists? Student: It made them seem more human to me. They aren’t just god given super geniuses. They just practice. How could we make the class better for the next person? Another Student: Nothing to say, this class was AWESOME!! The power of growth mindset is certainly being felt at The Think Tank, but its positive influence has spread throughout education, business, and professional athletics – all fields where practice gets results. At this point, you are probably thinking, “If Growth Mindset is good enough for the CEO of Google, professional athletes, and millions of students, then I want in! How can I get one for myself, or promote in my children, or students?” Fortunately, Carol Dweck has developed a simple four-step process for acquiring a Growth Mindset. If you don’t get a chance to have a visit from The Think Tank, check it out, and you will soon realize the transformative power of “yet”! Educational Horizons. (2013). Mindsets: How to Motivate Students (And Yourself). Educational Horizons, 91, 16-21. Harvard Business Review Staff. (2014). How Companies Can Profit from a "Growth Mindset". Harvard Business Review. Trouble in Human Brain Project Heaven? A mere 18 months after its announcement, the Human Brain Project (HBP), a gargantuan 10-year, €1.2-billion scientific endeavor, has hit a snag. Funded in large part by the European Union, HBP seeks to create a computer simulation of the entire human brain, including all its neural pathways. The project has the potential to forever change the way we understand human behavior, neurological disease, neuro-computing and more. Excitement and support for the project swelled within the scientific community and beyond, but now more than 200 scientists (and counting) from some of the most renowned institutions in the world, including Oxford and the University College of London, are threatening to boycott it and its sister project, the U.S. Brain Initiative. Many laboratories refused to join the project when it was first submitted because of its focus on an overly narrow approach, leading to a significant risk that it would fail to meet its goals. Further attrition of members during the ramp-up phase added to this narrowing. In June, a Framework Proposal Agreement (FPA) for the second round of funding for the HBP was submitted. This, unfortunately, reflected an even further narrowing of goals and funding allocation, including the removal of an entire neuroscience subproject and the consequent deletion of 18 additional laboratories, as well as further withdrawals and the resignation of one member of the internal scientific advisory board. In this context, we wish to express the view that the HBP is not on course and that the European Commission must take a very careful look at both the science and the management of the HBP before it is renewed. We strongly question whether the goals and implementation of the HBP are adequate to form the nucleus of the collaborative effort in Europe that will further our understanding of the brain. More than €1 billion in project funding remains on the line, and only time will tell how the European Commission and the HBP’s leading researchers will respond. 4. Wow, Will Leading Scientists Boycott the Humonguous Human Brain Project? Best for Last: Coding 101, Coming to a Classroom Near You? "Technology and computers are very much at the core of our economy going forward. To be prepared for the demands of the 21st century—and to take advantage of its opportunities—it is essential that more of our students today learn basic computer programming skills, no matter what field of work they want to pursue." Love it or hate it, schools, youth programs and non-profit organizations are catching on, and we are slowly but surely moving into a new system where coding could be a basic educational requirement, not unlike math and reading. Here at The Think Tank headquarters, we think this is incredibly, incredibly good news. For this month’s Best for Last series, we want to share some of the most interesting long-form news pieces, infographics and videos we’ve seen on this topic. Think we’re missing any links? Shoot us a comment! 1. Reading, Writing, Arithmetic, and Lately, Coding. Matt Richtel of the New York Times shows us what a growing movement to teach computers sciences looks in cities like Chicago, New York City and San Francisco. 2. Why Basic Coding Should Be a Mandatory Class in Junior High. The skeptic may ask, is learning to code really all that important? It’s a valid question. TIME’s Tim Bajarin explains why a basic understanding of computers could better equip our students for their futures. 3. TechCrunch reports that Codecademy, Donors Choose and Google have launched a novel partnership that aims to double the number of high school girls studying computer sciences. Through this program, both girls and teachers steer classroom time toward computers sciences and are eventually incentivized with DonorsChoose gift codes, which can be used to fund special classroom projects like field trips or cool teaching tools. 4. Computer science’s diversity gap starts early. Our tech-driven world needs more students to pursue careers in computer sciences, but it turns out there’s a diversity problem in this field. Kyla Calvert of PBS reports the numbers. 5. Code.Org is a non-profit organization dedicated to bringing computer sciences to more classrooms and inspiring young girls and minorities to pursue it as a career. Check out their infographic on the work still left to be done in computer science education. 6. We would be doing our followers a disservice if we didn’t post a link to MIT’s MOOC: MIT 6.00 Introduction to Computer Science and Programming. It’s a rough ride (the video is 54 minutes long) but so worth your time. World Cup 2014: Which Ball is the Fairest of Them All? For those of you who’ve been living under a rock, that epic global sporting event has graced our lives once more — the FIFA World Cup 2014. While we’ve all been busy rallying and cheering on our favorite teams (maybe? ), there’s another hero that has quietly entered the stadium — the Brazuca soccer ball. There’s a real science that goes into designing a soccer ball fit for the world stage, and it turns out Brazuca is a real work of art. Who knew? The scientists utilized several wind tunnel tests and a “kick robot” to measure and compare the flight characteristics of each ball. And it seems the complaints of those 2010 World Cup footballers might hold some truth: The physicists found the Jabulani ball performed the worst, while the Brazuca ball performed the best. So what exactly is it about the Brazuca ball that makes it so special? Deeper seams, which reduces “drag” and stabilizes its flight predictability. Six panels bonded with glue, which evens the weight and shape of the ball. Karen Kaplan at LA Times and Brian Palmer of the Washington Post each produced wonderful long-form news pieces on the physics behind building the perfect soccer ball. NASA conducted its own series of tests and found that, yes, the Brazuca soccer ball reigns supreme in the test of aerodynamics. Check out how Adidas took extra measures to make sure Brazuca would meet the needs and expectations of footballers. And this is random but fun: Brazuca has its own Twitter. And now you know! A couple weeks ago, I told you about my personal story behind The Think Tank’s new neuroplasticity lesson. Now I’m happy to share what we taught. We gave the same mindset questionnaire to students and put the results up on the screen. Reliably, the majority of students believed that intelligence and talent were fixed attributes. Did you think the same? You shouldn’t! As neuroscientsts have shown in recent history, brains are moldable by experience--they’re more like Play-Doh than cinderblocks. To drill home the Play-Doh metaphor, we had students perform our favorite BrainU experiment. First they performed a simple baseline task: throw beanbags underhand to hit a target five times in a row. Easy. Stage two was more tricky. We outfitted them with prism goggles, shifting their vision several centimeters to the right. While our bean bag tossers toiled, the rest of the class shouted out the direction of their misses: “Right!” “Right!” “Hit--wait, no--right!” As you can see, there was a trend. However, then something special happened: “Right!” “Right!” “Hit!” “Hit!” “Hit!” The bean bags started hitting their target. The bean bag tossers’ Play-Doh-like brains had adapted to their shifted visual world. Over here at The Think Tank HQ, we are so lucky to come across, meet and converse with some of the brightest minds in science. One day, we thought to ourselves: These individuals' insight, experience and wisdom are worth sharing with the world! So here we are, kicking off a brand new series of Rest Stop blog posts, dedicated to picking the brains of all these fabulous people. For our inaugural Rest Stop, we take a minute to talk to Terre Constantin, PhD, executive director of the Brain Research Foundation, a non-profit organization dedicated to supporting neuroscience research. Check out her interview below! What do you think about all this recent attention (and funding!) for brain research? TC: I love all of the attention that has been in the news recently about brain research. Of course, that is what the Brain Research Foundation supports, so anything that gets neuroscience in the news is not only good for science but great for organizations like the BRF and Think Tank. The funding side is an interesting question. I assume that most people are thinking about the BRAIN Initiative, a $100 million commitment that the White House announced in April 2013. And while once again all funding is great for neuroscience, there were two keys points that were not really mentioned: 1. That private organizations are playing a huge part in this initiative (The Allen Institute for Brain Science and Howard Hughes Medical Institute). 2. That in May 2013, the government cut research funding by $1.55 BILLION. The take home message is that private funding is critical in advancing scientific discovery. What excites you most about current brain research around the world? TC: The most exciting thing is all of the amazing advancements that are happening. The brain is unbelievably complex so cures for neurological diseases take time. But we are building the knowledge about the brain that will get us to those answers. I believe that treatments and eventual cures are definitely within our lifetime. Do you have a role model in the STEM/brain research field? If so, who and why? TC: It is going to sound like a lame, rehearsed answer but all researchers that stay in academia, relentlessly trying to understand the complexity of the brain. They work so hard, writing grants and scientific articles, running a lab. It is a very hard job. They are extremely dedicated to science, and I applaud them for it. TC: I loved science and math throughout school but really became interested in science when I got to “see things up close and in action.” When we started to have science lab and do experiments in chemistry, physics, etc. I am a visual person so that solidified it. I knew I wanted to find out more. That is why The Think Tank is such a great concept. Bringing science to kids is key. Giving them a chance to have a hands-on interaction with science is not only interesting — it is fun. And science really can be FUN. How do you think we can get kids, especially young girls and minorities, excited about exploration and discovery in STEM or neuroscience in particular? TC: The sooner the better. We need to show kids how cool and fun science is. Many children just don’t have the opportunity to talk to or interact with a scientist. We need to make it accessible by bringing it to them. I think that coming in contact with a program, like The Think Tank, could be very beneficial. There are a lot of students’ lives and career paths that could be changed by understanding how important science, and because I am biased, how important neuroscience is. If you could share one cool/fun brain fact.... go! TC: Perhaps a lot of people know this but it is always still amazing to me….the human brain has about 86 BILLION neurons. WOW!!!! That is all I can say. When I was 8, my mother drove me to a parking lot to teach me how to ride a bike for one final time. I fell into a bush. I scraped my knee on concrete. I complained that the seat hurt my crotch, before ramming into a car. Finally, I threw such a tantrum that we packed the bike back into our Toyota and left. I had failed before my feet touched pedals because of a false belief. I knew of only the old theory about brains: Until recent years, it was taken as a given that the brain was like a cinderblock, like concrete that becomes fixed soon after its molding. This theory is intuitive. Most of us can peg someone who showed talent from the time of their youth. History celebrates the legends of these savants: they have names like Mozart and Newton. And at age 8, I was about as far from being the Mozart of bike-riding as one can get. What I didn't know was that — at that very moment, while I was busy overturning my bicycle — scientists were busy overturning the old theory about brains for a new one. Under this new theory of neuroplasticity, the brain looks much more like a muscle. Muscles start feeble. But no matter your age, ethnicity, or gender, your muscles can always grow. When I learned of this theory as a college junior, I took it to heart. I used to believe that I was born an introvert, that I was doomed to fail in science and math, and that I was destined to never ride a bike. Yet recently, I found myself at Droplet teaching a Think Tank class in front 30 high schoolers as a member of Dr. Daniel Casasanto’s cognitive science lab. And that morning--having just taught himself to ride a bike at age 23--I’d ridden my bike to the lab. If the brain stay fixed throughout the lifetime, you might imagine that intelligence and talent are fixed attributes. However, if the brain is plastic, you might imagine that your abilities can grow throughout the lifetime. This was the topic of The Think Tank’s lesson that day. Tune in next week to hear more about what we taught! Controversial scientific topics are dominating mainstream news headlines these days: climate change, evolution, vaccines, stem cell research.. the list goes on. Newsrooms portray two sides to every story, but too often these news stories are muddied with sensationalism, unclear/incomplete messaging or straight-out falsities. Given the pace at which news is consumed, it's scary to think of the damage that can be or is done by publishing subpar science news. For these reasons, accurate science communication plays a very (very) important role in today's hyper-digitized age. There's a growing movement to train and engage science communicators in separating fact from fiction and relaying those key differences to mainstream media and lay audiences. Maria Klawe: Is it odd to be a mathematics professor teaching writing? Rachel Levy: I never imagined that as a mathematics professor I would be allowed to teach writing. But even before the college implemented WRIT 1, mathematics courses emphasized communication. Some assignments have “style points” for clear writing, and students take pride in their homework. We have a required public speaking course for all mathematics majors. Communication skills are like a superpower. When students develop these skills, they gain tools that will serve them well beyond college. I was convinced to teach WRIT 1 when a chemistry professor told me that it would improve my own writing. It has; I used to avoid writing tasks, but now I find myself writing almost every day and enjoying it. Klawe: How is teaching writing different from teaching computer science? Colleen Lewis: In my computer science teaching I often encourage students to use the problem solving strategy of “solve a simpler problem.” This strategy falls flat in writing—“Having trouble with your essay? Write a different one!”—not a crowd-pleasing suggestion. However, learning to communicate ideas is at the heart of learning across the disciplines. In computer science, it isn’t about hacking together a computer program; it is about communicating an algorithm that needs to be understandable to both computers and humans. Over at TTT headquarters, we've been geeking out over some incredibly funny, entertaining, insightful and inspiring TED Talks ranging in topics from education reform to scientific discovery. It would be bad form to keep these gems from our supporters, so here's a running list of our favorite Talks (some of which we’ve already shared). Trust us — you won't want to miss any of these. "I think that this capacity to constantly subvert our way of thinking about the world makes parasites amazing. They're constantly inviting us to look at the natural world sideways, and to ask if the behaviors we're seeing, whether they're simple and obvious or baffling and puzzling, are not the results of individuals acting through their own accord but because they are being bent to the control of something else." "Largely because of that visit [to the Pantheon], I came to understand that, contrary to what I was being told in school, the worlds of art and design were not, in fact, incompatible with science and engineering. I realized, when combined, you could create things that were amazing that couldn't be done in either domain alone." "In many patriarchal societies and tribal societies, fathers are usually known by their sons, but I'm one of the few fathers who is known by his daughter, and I am proud of it." "I watched the first people walk on the moon and to me, it was just an obvious thing: I want to somehow turn myself into that. But the real question is, how do you deal with the danger of it and the fear that comes from it? How do you deal with fear versus danger?" "What is the intersection between technology, art and science? Curiosity and wonder, because it drives us to explore, because we're surrounded by things we can't see." Who doesn’t love a good sci-fi movie? Director Wally Pfister, Johnny Depp and the rest of the cast made the media rounds to promote their latest film, Transcendence. The movie didn't perform well its opening weekend despite the $100 million price sticker for production. Despite the studios', crew's and actors' best efforts, two unsung heroes take the spotlight in this week’s blog post. Prior to filming, Pfister made a trip to UC-Berkeley to visit two scientists who possess very specific and invaluable knowledge for the film project. Jose Carmena, PhD, who is also co-director of the Center for Neural Engineering and Prostheses, is a prominent researcher and authority in brain-machine interface systems. And Michel Maharbiz, PhD, co-director of the Sensor and Actuator Center and Swarm Lab at UC-Berkeley, is famously known for helping develop the world’s first remote-controlled cyborg beetle. Carmen and Maharbiz went on to serve as consultants on the film, even going over the script with Pfister, line by line, to vet the science of the film. The freakiness of artificial intelligence has intrigued the masses for years, but the concept (as both a sci-fi subgenre and scientific field) is gaining more and more steam. Who could forget IBM’s brainchild Watson? Others have since caught on. Google acquired artificial intelligence company DeepMind and launched its Quantum Artificial Intelligence Lab last year. Facebook also opened its own AI lab, and one of its more recent computer intelligence projects demonstrated astonishingly accurate facial recognition. It’s not hard to see why there is so much buzz and excitement in this cross-section of neuroscience and tech — We are making our computer faster and smarter. So smart, in fact, that some researchers reported computer systems can learn from experience. But back to the basic premise of Transcendence: Is it possible to actually upload a mind into a computer? Experts say, theoretically, yes. Without delving too deeply into the theory and ethical/existential implications of technological singularity (Google at your own risk), it’s safe to say the possibility of human-machine is mind-boggling, exciting and.. scary. As with anything that possesses great power, there is potential for both good and ill. Here’s a great LA Times feature that more deeply explores the reality of artificial intelligence. Last week in Boston, the Cognitive Neuroscience Society hosted its annual meeting, bringing together some of the brightest minds in academia to share exciting new research in the field of cognitive neuroscience. Poster presentations and symposia sessions were as wide and varied as the field itself, with topics ranging from our developing understanding of language processing to the dynamic role of functional neuroimaging to the complexity of sleep and its impact on the brain and our lives. One particularly interesting poster presentation caught our eyes (and the eyes of the meeting attendees — it was a People’s Choice Award winner!). Ever wonder why a certain song evokes a strong emotional reaction within you? Think: songs from graduation ceremonies, weddings, break ups. You get the picture. Well, there’s a neurobiological reason for that! There is a part of our brain — the medial prefrontal cortex (mPFC) — that has been understood to be the center that interweaves music with memory and emotion. So what happens when this region of the brain is damaged? Researchers from the University of Iowa recruited volunteers with no brain damage, damage to other parts of the brain and damage to the mPFC. The researchers exposed each participant to a musical stimulus (popular music from when they were 15-30 years old) or visual stimulus (facial images of prominent people during those same years). The participants were then asked to describe what memories came to mind. The investigators found that volunteers with no brain damage or damage to other areas of the brain recalled music-evoked memories with much, much more detail then facial-evoked memories. On the other hand, volunteers with mPFC damage recalled fewer vivid music-evoked memories, and any music-evoked memories they could describe were not any more detailed or vivid than facial-evoked memories. Their findings suggest the powerful ability to recall detailed memories from songs comes from this 3-pound jelly-like organ inside our heads! 1. Even though the right hemisphere of our brains is thought to be more strongly associated with music perception, aphasic individuals (language dysfunction) with damage to the left hemisphere also suffer from amusia (music perception disorder). 2. Deep brain stimulation of the subthalamic nucleus caused study participants to make less risky financial decisions. Know anyone who might benefit from this? 3. Women are much better at perceiving the color red than men. Principal investigators give their two cents on why this could be. *Cue Chris de Burgh’s Lady in Red. 4. A patient who feels like he or she has more in common with a doctor will report less pain than those who didn’t feel that way, regardless of ethnic differences. 5. Gray matter volume in the amygdala could influence how accurately we determine trustworthiness in people. And there’s more where that came from. Head over to the Cognitive Neuroscience Society's page to read through more fascinating poster presentations! Bonus video. We'll leave this right here.